(Bloomberg) -- When a country’s economic growth slows, its stock market usually follows suit. Not in Australia. 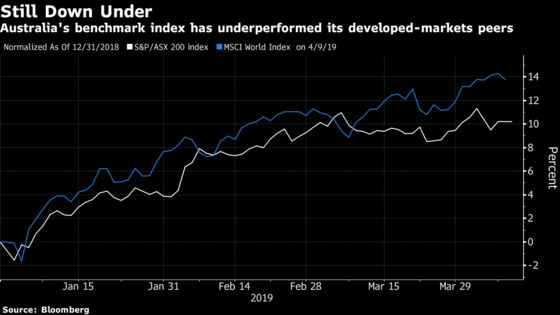 Despite a backdrop of troubling economic signals, the nation’s benchmark S&P/ASX 200 Index rallied almost 10 percent in the first quarter -- its best-ever performance to begin a year in data going back almost three decades. Strong commodity prices and promises of easy monetary policy from central banks are working in the gauge’s favor even as Australia’s property slump deepens and its economy continues to wane. Australia experienced its weakest six-month expansion since the global financial crisis, according to gross domestic product data released last month. It’s also in the middle of its worst housing slump in a generation, as plummeting property prices and a credit squeeze weigh on consumers. Consumer-staples stocks bore the brunt of a weakening economy after a disappointing earnings season. The S&P/ASX 200 Consumer Staples Index is up only 4.4 percent this year, and the outlook isn’t all that rosy as households spend less. And while that has hit a corner of the stock market, the key equity gauge has kept calm and rallied on. Even the International Monetary Fund’s cut in its global growth outlook to the lowest since the financial crisis has barely moved the needle for the nation’s equity market. Japan’s Topix and Hong Kong’s Hang Seng Index fell -- but Australian stocks managed to eke out a gain. The key stock gauge has persevered in part thanks to strength in commodities markets, which have propelled resources to become Australia’s second-best performing sector this year. Iron ore’s supply shock in Brazil has helped prices of the raw material rally, lifting miners like BHP Group Ltd. and Fortescue Metals Group, said Aaron Binsted, Sydney-based portfolio manager at Lazard Asset Management. BHP, which has the second-highest weighting on the gauge, is up 17 percent this year, while Fortescue has soared 95 percent. “With commodity prices as they are, profitability could be as high as at any time outside of the super cycle, and reflecting this in share prices, even only partially, could start to make the sector expensive,” the analysts said. The benchmark has also benefited from the dovish slant by major central banks, which sparked a global rally amid bets that accommodative policies could bolster earnings. Closer to home, Reserve Bank of Australia Deputy Governor Guy Debelle said Wednesday that the central bank remained in wait-and-see mode for now and didn’t hint at a switch to an easing bias (something analysts had expected). Still, Creagh cautioned that central bankers’ pledges for patience on rate moves can only prop up markets for so long. And even though the nation’s stocks are on the upswing, their performance is still underwhelming compared to their overseas counterparts. The ASX 200 lags behind other benchmarks, ranking 19th among 24 developed markets. 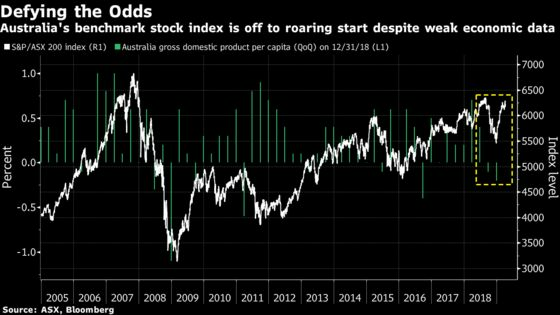 The next earnings season in Australia and the one now underway in the U.S. will be crucial to see how companies perform against slow global growth, Creagh said. “It’s going to be pretty hard for earnings to continue to support the performance that we’ve seen in equity markets so far,” she said. Financial stocks in particular, which make up about a third of the gauge, may be in for a rough time. They gained earlier this year after the Royal Commission inquiry into industry misconduct didn’t recommend a structural overhaul of the nation’s banks or tighter lending rules, which was widely seen as a reprieve for the sector. But financials are up a mere 4.4 percent this year, the worst performers in the benchmark. “We don’t see much prospect for earnings growth over the coming quarters for the Australian banks, particularly as the property market continues to slide,” Creagh said.